Shows | LAURA FREEMAN SINGS! Here you will find some of the songs, set lists and themed shows that I do in my act. If your looking for talent to book for a show or event, this will show you what I can do! If you are indeed looking for performers and performances, please use my "Contact Me" page for bookings or just to get on my mailing list! Laura Freeman, Beckie Menzie , and Marianne Murphy-Orland salute singer/songwriters Carol King, Joni Mitchell, and Carly Simon in Girls Like Us. 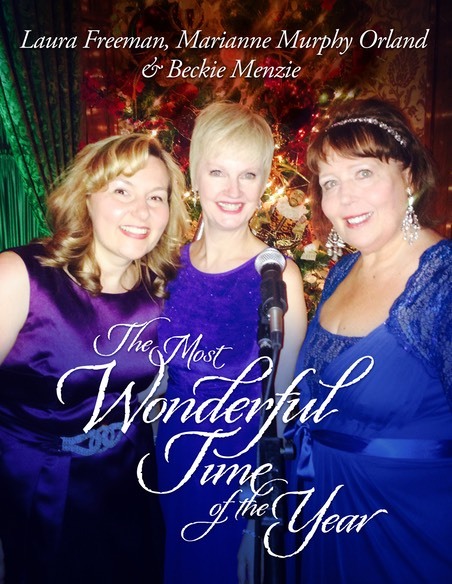 Menzie’s arrangements enrich the trio. They are complex and vibrant, while not diminishing the emotions underlying a song. This is demonstrated well in Simon’s “That’s the Way I Always Heard It Should Be.” Girls represents artistic breakthroughs for both Freeman and Murphy- Orland. 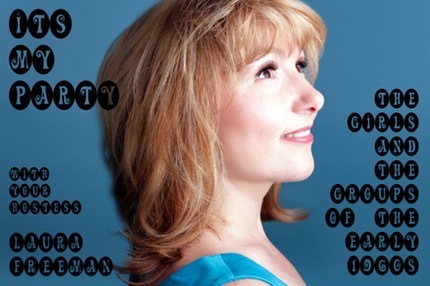 Murphy-Orland-- typically comfortable in a limited alto range allowed her upper register to soar not only bringing vocal shimmer, but enabling broader interpretive chops. We hear this well in Carole King’s “Natural Woman.” Freeman has toured with excellent salutes of Doris Day and Julie Andrews. So, “Fierce” and “Freeman” were an unlikely pairing. However, in Carly Simon’s “You Belong to Me” Freeman pulls out the stops building to possessiveness and desperation in powerful ways. Dialogue explored challenging relationships with men as a common thread shared among the songwriters. Speaking of powerful, Beckie Menzie delivers in Simon’s “Let the River Run.” Written for Working Girl it is a salute to powerful women. 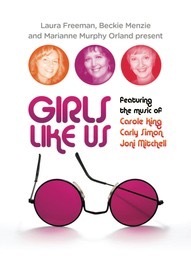 Girls Like Us honors six of them. In audience terms, they’ve got a friend. Ultimate Divas of Stage, Screen and Popular music, Barbra, Bette and Bernadette have made their mark from the Baths to Broadway and beyond! 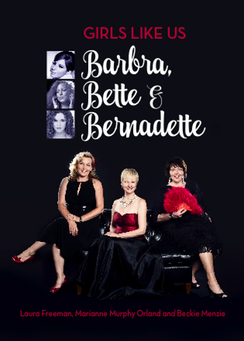 With their fifth collaboration, Girls Like Us (Cabaret favorites Laura Freeman, Beckie Menzie and Marianne Murphy Orland), bring you the music and lives of Barbra Streisand, Bette Midler and Bernadette Peters with humor, history and song. 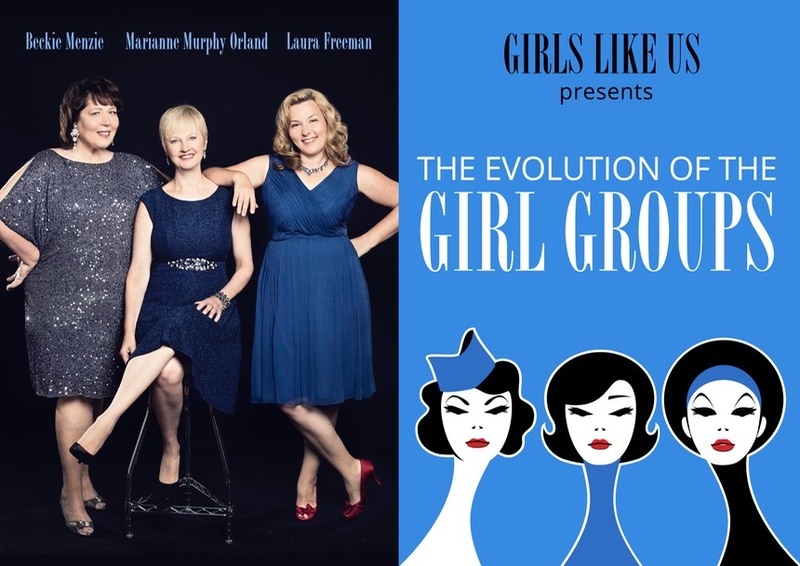 The "girls", Laura Freeman, Marianne Murphy-Orland and Beckie Menzie reteam to present a salute to the girl groups! Starting with the Andrew Sisters, the sound of women has resonated with each generation. The tight big band sound of the Boswells and the Andrews, the call and response of the Shirelles and the Supremes and the lyrics that looked at the world through distinctly feminine eyes like the Dixie Chicks and the Bitchin Babes....all are represented in this fun, harmony filled retrospective! 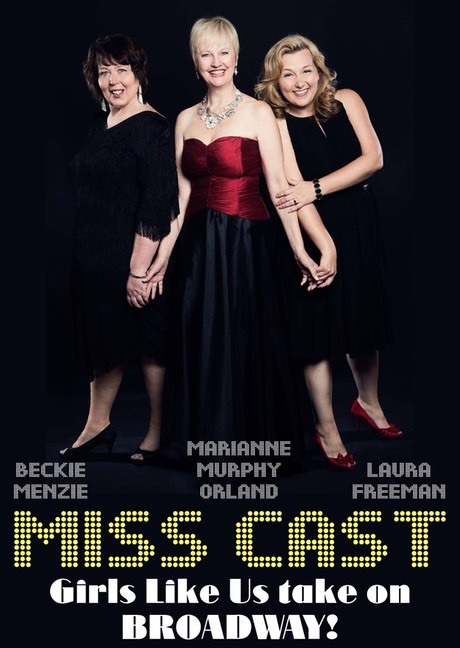 Celebrating the music of Broadway in a totally different (or truly unique) way, Miss-Cast – Three Women in Search of a Musical brings together three of Chicago Cabaret’s finest OR (Chicago’s cabaret favorites), singing hits from roles they never could have, would have or should have played! Experience West Side Story, Avenue Q, Fiddler on the Roof from the GIRL”S viewpoint. ,..(If I Were a Rich Girl). Puppets, props and personality help the GIRLS to show you perhaps they weren’t Miss Cast at all! JOIN LAURA FREEMAN AS SHE CELEBRATES THE LADIES OF THE 60’S: LESLIE GORE, MARY WELLS, THE SUPREMES AND MORE. MARTHA AND THE VANDELLAS, IN 1964 AND CONNIE FRANCIS, THE TOP FEMALE VOCALIST OF THE 50’S…THOSE ARE THE BOOKENDS. WHEN WE TALK ABOUT MUSIC FROM THE 1960’S, MOST PEOPLE THINK OF BOB DYLAN, THE BEATLES AND JIMMY HENDRICKS, BUT THAT IS REALLY JUST PART OF THE STORY! THAT SMALL WINDOW OF ABOUT 8 YEARS CHANGED MUSIC FOREVER WITH THE BIRTH OF A GENRE MOST HISTORIANS DON’T EVEN ACKNOWLEDGE; THE BIRTH OF BUBBLE GUM POP. SUDDENLY THE AIR WAVES WERE JUMPING WITH THE SOUND OF WOMEN…NO, GIRLS; TEENAGE GIRLS AND THEIR TEENAGE PROBLEMS. JOIN LAURA FREEMAN AS SHE CELEBRATES THE SOUNDS OF THE VANDELLAS, THE MARVELETTES, THE SUPREMES, THE RONETTES, DIONNE, DUSTY, LESLIE, MARY AND MORE! 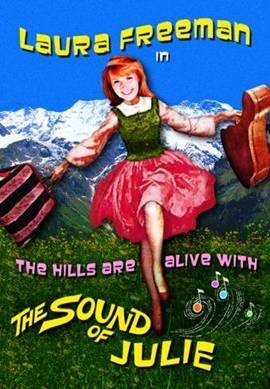 The Hills are Alive, with the Sound of Julie, chronicles the life of Julie Andrews, from her beginnings in Vaudeville to her vocal struggles of today. Both her autobiography Home, as well as a fan’s biography of her, were used to create wonderful stories about her life and career. Hits include: The Sound of Music, I Could Have Danced All Night, Le Jazz Hot, and A Spoonful of Sugar. If you're a fan of Julie Andrews, you should definitely check out Laura Freeman's musical celebration of the "loverly" lady. 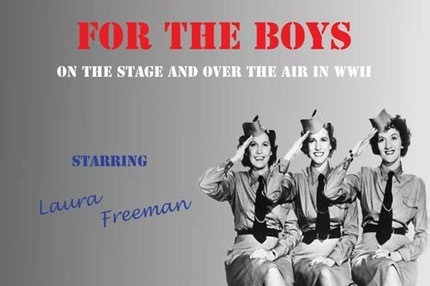 Laura honors veterans with a concert full of World War II music including uplifting songs such as "Accentuate the Positive," sentimental favorites like "I'll be Seeing You" and patriotic anthems like "God Bless America." She puts the songs together with stories that highlight how music played a big part in keeping morale up for both soldiers and those on the home front. 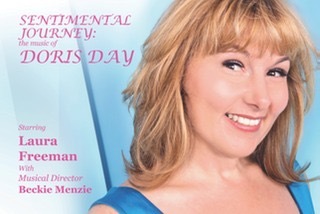 Sentimental Journey…the music of Doris Day! Having recorded over 600 songs, Day is known for such hits as Sentimental Journey, Secret Love and Everybody Loves a Lover. Doris was not just a pretty voice and a pratfall. She represents the spirit of us all, at various times in history. She was the voice of the returning service men from World War II. She was the voice of the early women’s lib movement, representing single career woman everywhere. She was also the voice of a grieving gay community, at the height of the AIDS crisis. Her rendition of My Buddy, sung for her friend Rock Hudson, was used to say goodbye to sons, brothers and lovers in the early 80’s. Won’t you join me in celebrating this amazing lady?